Garmin today announced the development of their new outdoor explorers watch the Garmin Fenix. Its early days and little is known about the specific features apart from their own press release and website but what we do know is that is will be closely compared to the Suunto Ambit in both design, features and even pricing. You can create and follow routes and mark up to 1,000 waypoints which you can navigate with ease. In addition fēnix can store up to 10,000 track points. Share data wirelessly with other compatible Garmin GPS units and smartphones*. Naturally, as a navigating GPS+ABC watch, it also includes altimeter, barometer, 3-axis electronic compass and temperature sensor. Rugged, stylish and waterproof to 50 m (164 ft), it’s as comfortable to wear everyday in the city or off the beaten path while having one of life’s greatest adventures. No other navigator GPS+ABC wristwatch offers you the GPS navigation capabilities of Garmin — The world’s most trusted name in navigation. fēnix tracks where you have been, but it can also guide you into the wilderness and, more importantly, guide you back out again so you can feel 100% confident and safe with every step you take. It records a track log, creating a GPS “bread crumb trail” as you move. It also allows you to mark waypoints, such as your vehicle location, safety shelter, great viewpoints and other POIs (points of interest). With fēnix, you can create and follow routes, mark up to 1,000 waypoints and store up to 10,000 track points. You even can create your trip data on BaseCamp™, the free desktop trip-planning software from Garmin. Plan your trip at home, download all data to fēnix and follow the navigation arrow to waypoints or the clearly visible track line to your destination. Use TracBack™ to show you the way home. Rugged and attractive, the fēnix is also a highly accurate timepiece that can be worn everyday. It includes settings for alarms, chimes and vibration alerts. It also functions as a timer, stopwatch and world clock. But above all it is the ultimate statement for your mountain and outdoor lifestyle. fēnix has a built-in barometric altimeter that provides accurate elevation information along your way. This enables you to keep track of your ascent and descent, so you always know how high you climb from base to summit. With automatic calibration, altimeter accuracy is improved thanks to fēnix continuously monitoring and recalibrating the sensor. So you will always know how far you have to climb until you reach your destination. The built-in barometer can help you monitor and predict weather changes by showing you short-term changes in the barometric air pressure. As an example, if the barometric pressure begins a steady decline, this is an indication for an impending storm. fēnix includes a 3-axis electronic compass that keeps your bearing in any position and also whether you’re moving or not. Sight a bearing and be confident fēnix will keep you headed toward your goal. The compass sensor can alternatively be set to automatic calibration ensuring you always hit your destination point. Similar to Garmin’s world leading GPS running watches, fēnix provides comprehensive real-time performance monitoring for athletes such as trail runners and ski mountaineers. With lap and autolap function and important performance data e.g. distance, vertical speed and pace, ambitious mountaineers can keep track of their progress during their outdoor training or other fitness activities. fēnix is also compatible with Garmin’s optional premium heart rate monitor for heart rate information or with a speed/cadence sensor for distance, speed and cadence while on a bike. All displayed data fields are fully customisable right off the wrist. You can gain insight into temperature trends from the built-in temperature sensor. 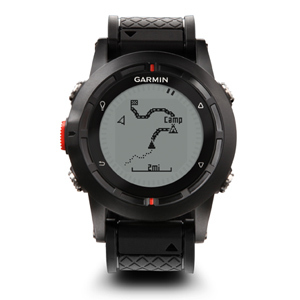 With tempe™ Garmin has once again broken new ground in terms of accuracy for outdoor watches. Tempe™ is Garmin’s new ANT+ temperature sensor which gives you precise ambient temperature reading without influence of body temperature. Knowing how rapidly the temperature is rising or falling can help you determine clothing and shelter needs, and whether it’s time to turn back. You can easily share tracks, waypoints, routes and paperless geocaches wirelessly with other compatible Garmin GPS units and smartphones*. fēnix is equipped with both ANT+™ capabilities and Bluetooth® technology. that’s actually pretty exciting – the Ambit is a brilliant bit of technology and reliably finds satellites quickly as well as giving accuracy over distance now that the updates are on board. But Garmin have always been able to juggle simultaneous navigation and sports tracking, as well as giving the option to toggle screen setups on the run and away from the computer. Suunto, on the other hand, is near impossible to beat for physiology. they’ve definitely been pushed by Suunto to progress their gadgetry, but it’s going to be fascinating to see how user-friendly Garmin’s new unit will be. Just the fact that the Fenix appears to have Trackback on board is promising. This looks like an amazing piece of kit. I’ve been considering both the Ambit and the 910XT but neither does exactly what I would like for running. The fenix looks like it does everything I need for my long runs (with the addition of the heart rate strap). It also looks like it has more than just a 1 sec or 60 sec GPS mode, which means more longer battery life while running if you knock the refresh rate down to 5 sec or so. Can’t wait to get a few more details about the running features like pace, intervals, nutrition alerts, etc.